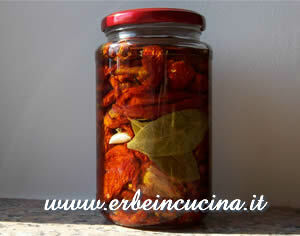 My family loves sun dried tomatoes, and my partner prepared this lovely jar with them. My grandmother dry the tomatoes, and I can tell you that is a long work. You have to cut them in half, and sprinkle them with the right dose of salt: if you use too much salt they will be oversalted, if the salt isn't enough they could moulder. Then you should expose the tomatoes to the sun for many days, and remember to take them inside every evening. Remember also that 10 kilos of tomatoes will result in a couple of sun dried tomatoes jar. ...and remember that they can be bought. Put the sun dried tomatoes in a jar, adding some garlic cloves cut in half and some dried oregano. When the jar is full, put the bay leaves in it, so they can be seen from the outside. Fill the jar with a good olive oil. This goes to Anna's Cool Finds who's hosting Weekend Herb Blogging. The recap is published! Thanks for your participation.